When you get the recipe, please let me know. I have been looking for this pepper for years now. I can’t find anything like it. Thanks for your help! I have been looking for SZECHUAN SEASONING and also STIR FRY SEASONING and have not been able to find them. Wonder how one finds out if they have discontinued it. If you know, I’d appreciate the information. Thanks. When you get it right, Please send me the recipe too. We love it and can’t find it anyplace. Had one old bottle of it that is almost gone. Much to my disappointment, I just found out yesterday that it was discontinued. Thanks for posting the spices to recreate it. I think I’ll give it a try. It is really disappointing that McCormick has not brought this wonderful spice back. I still check the spice section at my supermarket from time to time. In a few minutes I am going to post results of my updated experiment in re-creating the Szechuan Style Pepper Blend with the specific measurements. Please let me know what were your results. Hi, I will post my results in a few and email them to you also. Thanks for commenting. 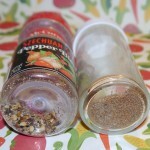 Best to either contact McCormick directly by calling 800-632-5847, posting an inquiry via their online email/message form, or via Facebook: https://www.facebook.com/McCormickSpice. You can Google McCormick discontinued spices… I found this site by doing so… http://www.mccormickgourmet.com/DiscontinuedProducts.aspx. I was searching for a replacement for this seasoning and found your post. Thank you so much for sharing! Thanks for writing to me and letting me know about this. I really appreciate it! I will keep my eyes out for it whenever I’m in my local Asian grocery stores :)! The MSG part is a bit disheartening though… Yes, I will agree that a homemade blend isn’t quite the same but the beauty of it is you have more control of the ingredients and can custom the taste to your preferences. Thanks again and sorry for the delayed response. You’re very welcome. I can empathize. Why good/popular items are discontinued, I will never understand why. Thanks for your kind comment :). 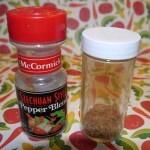 I have perhaps one meal’s worth of my McCormick’s Szechuan Pepper Blend, and can’t believe that it’s been discontinued. I also can’t believe that I can’t find it on the internet. It’s this search that brought me here, to share my disappointment with the other few who might relate to my pain. Yeah, I know what you mean :(. It always saddens me when they discontinue certain beloved items and leave no possible substitute. Treasure that little bit that’s left and please try the blend I suggested. I’m curious as to what you think of it. Thanks for finding my post. P.S. Please forgive my delayed response. I have no idea how your comment was overlooked! I’m so sorry. I did post a blend I had tried which came kind of close to the original but not exactly. Scroll down until you see it. Hope you give it a try. Thanks so much.